The Cruse Scanners are widely recognized around the world as among the best scanners you can buy. That is why they are typically found in fine museums and major universities, where it is important to capture the fine details of both flat and three dimensional objects. The scanner that is coming to Doylestown is a brand new state of the art Cruse Scanner that has been customized to meet the specifications of DRS, a large format print shop. 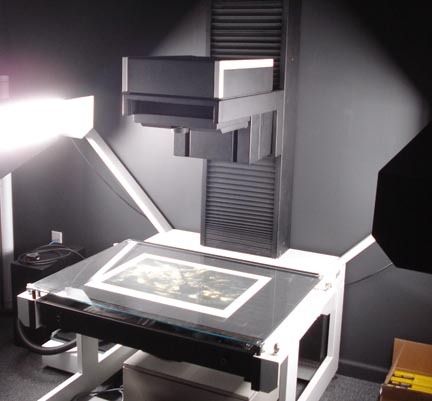 The new Cruse Scanner will have a new led lighting system that will provide better color and dimension to the scans. The scanner will include the patented German optics, for extreme precision and detail. The scanner is complete with upgraded and updated software to enable and enhance the scan image in order to add more depth and contrast. We can’t wait to roll out the new Cruse scanner this summer 2017. DRS customers have already been praising the results from the current ‘old’ Cruse Scanner – wait until they see what we are able to do with the new model. We expect they will be even more excited about the new Cruse Scanner and what it can do. A brand new state of the art Cruse Scanner is on its way from Germany to DRS in Doylestown, stay tuned for more updates as they occur.